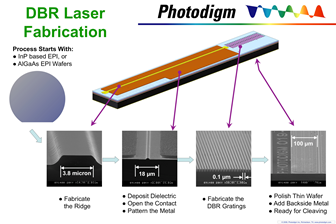 The Photodigm family of high-power edge-emitting Distributed Bragg Reflector (DBR) laser diodes is based on Photodigm’s proprietary single epi growth DBR laser architecture. The Photodigm DBR laser architecture consists of an electrically pumped gain region and a separate passive DBR grating region, monolithically fabricated over a continuous ridge waveguide. This design has resulted in the world’s highest power commercially available, single-frequency, and monolithic laser diodes with performance specifications that rival benchtop research lasers. Over the years, Photodigm DBR lasers have proven themselves to be ideally suited for applications requiring high-power single-frequency performance within a well-defined operating range. Photodigm has worked with its customers to develop a family of laser products unmatched in the industry. Optimized for stability, reliability, and power, these devices have opened up opportunities for an emerging class of cost-effective precision mobile instruments for applications in spectroscopy, atomic physics, non-linear optics, and quantum information. The DBR laser is often compared to the distributed feedback, or DFB, laser. Both DBR and DFB lasers are single frequency, diffraction limited, narrow bandwidth laser diodes. Most users will recognize the DFB as having an extended continuous tuning range, typically 2 nm within a continuous current and temperature tuning range. They will also associate the DBR with a similar tuning range, but one which is subject to periodic mode hops as the current or temperature are adjusted. Mode hops in a conventional DBR will typically occur with a free spectral range of approximately 0.15 nm as the device is tuned by current only with a slope of 0.002-0.003 nm/mA. While this free spectral range is acceptable for most applications, certain applications require a continuous tuning range of as much as 2 nm. Photodigm has recently introduced a new product, the X-Mode™ DBR, which combines the best attributes of a DBR laser with the tuning characteristics of a DFB. This breakthrough is a result of Photodigm’s extensive experience in the design and operation of laser diodes. By careful design and thermal management of the device, Photodigm’s X-Mode DBR will operate with a continuous wavelength range of 2 nm when tuned by temperature or current. Mode selection in a single frequency laser diode is a result of careful design of multiple elements in the laser. It requires that the laser resonator select a single spatial and longitudinal (wavelength) mode. A distributed Bragg reflector (DBR) laser, shown below in Figure 1, consists of two parts, the gain ridge and a passive DBR mirror. The spatial mode is produced and amplified only in the gain ridge, where current is injected. The gain ridge is designed to constrain the lasing cavity standing wave to a single spatial mode. When operated in a free running condition, the spatial mode will be composed of multiple cavity or longitudinal modes whose wavelengths are determined by the gain curve of the epitaxial structure and whose spacing is determined by the boundary conditions of the cavity length. The DBR grating is a wavelength selective mirror. 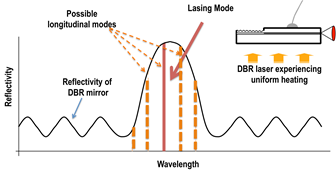 The laser operates at a single wavelength determined by the relative peaks of the DBR mirror reflectivity and the gain profile of the epi material. Figure 1. Elements of a DBR laser. A laser will lase only in discrete modes. Tuning a semiconductor laser is effected by changing the operating conditions, as by temperature or current. Such changes affect the index of refraction of the lasing medium. The gain curve of the epi material shifts by 0.3 nm/C° and the peak DBR reflectivity shifts at a rate of approximately 0.06 nm/C°. The characteristic wavelength-current curve of a conventional DBR laser will exhibit discontinuities in the spectral output as the laser injection current is increased. For increasing current, the wavelength of the lasing mode will increase and the DBR mirror reflectivity will gradually decrease. Eventually, the selected mode will no longer be the most favored mode, and the laser will suddenly blue shift, selecting a new, shorter wavelength, mode. Figure 2 shows a typical wavelength-current behavior for a conventional DBR laser. Figure 2. Typical tuning behavior of a DBR laser. As the current is increased the wavelength red shifts with a characteristic of about 0.003 nm/mA. Temperature tuning is about 0.06 nm/C°. The overlap of the reflectivity of the DBR mirror and the allowed longitudinal (cavity) modes of the gain ridge are shown schematically in Figure 3. If the DBR reflectivity and the peak gain wavelength move at the same rate, no mode hop occurs. On the other hand, if the epi gain curve thermally shifts at a faster rate than the DBR mirror, then the cavity modes will red shift faster than the reflectivity curve of the mirror. Eventually, a new mode will be favored, and the laser will experience a mode hop. Figure 3. Overlap of cavity modes with DBR reflectivity. current injection into the gain ridge causes heating of the gain medium, while the passive DBR mirror remains at the heat sink temperature. A change of 50 mA in current will induce one mode hop over a less than 0.2 nm tuning range as the cavity modes red shift and a new, shorter wavelength mode now becomes the highest gain mode. By contrast, the DFB laser is characterized by a buried grating that runs the length of the gain ridge. Current is injected all along the buried grating/gain ridge, so that both experience the same thermal conditions, leading to an extended mode hop free operating range. However, as the DFB device ages, it will typically experience a red-shift mode hop across the stop band. This will result in a distinct gap in its wavelength tuning range. 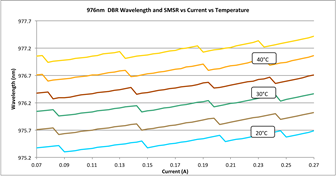 The free spectral bandwidth of the DBR is sufficient for most instrumentation applications, especially where the operating wavelength is spectroscopically locked. For example in atom trapping, the wavelength is locked to the required transition and not subject to mode hopping over its entire lifetime. On the other hand, some applications require a greater tuning range. These include Raman spectroscopy, oxygen sensing, and low noise optical pumping. In these applications, a mode hop would be disruptive. To meet the needs of these customers, Photodigm has recently introduced the X-Mode DBR, which provides up to 2 nm mode hop free tuning in both temperature and current. 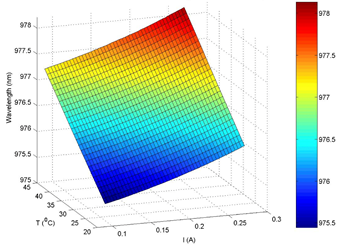 Figures 4 and 5 show the operating parameter space contrasting the mode hop characteristic of a conventional high performance 976 nm Photodigm DBR with the new X-Mode DBR product. This new product was developed as a result of Photodigm’s extensive experience in designing and producing precision lasers and meeting the needs of its customers. Figure 4. 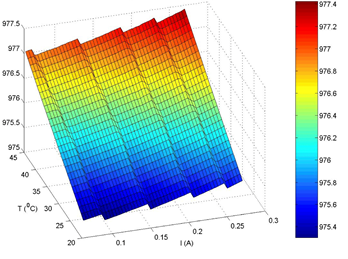 Wavelength-Temperature-Current surface plot of conventional Photodigm 976 nm DBR laser. Figure 5. Wavelength-Temperature-Current surface plot showing the extended mode hop free tuning range of the Photodigm X-Mode DBR laser. Photodigm has recently been granted two US patents covering its X-Mode DBR laser. These products provide as much as 2 nm tuning rate. They are currently shipping. DFB and DBR laser are the two most common forms of high power single frequency semiconductor lasers in use for scientific instruments today. They both offer high efficiency and remarkable spectral purity, thus enabling many metrological instruments. Photodigm DBR lasers have been shown in multiple applications to provide high power, high reliability, low noise, low linewidth, and stable operating characteristics for long lifetimes. The single growth epi and separate passive DBR mirror, which distinguish Photodigm DBR lasers from competitive DFB lasers, are the primary reasons for their success. Photodigm has introduced a new product, the X-Mode DBR laser, which offers a similar extended mode hop free tuning range to the DFB with the superior attributes of the DBR. A result of Photodigm’s ongoing R&D into its products, the X-Mode DBR will operate with a continuous tuning range of greater than 2 nm when tuned by temperature or current over its entire lifetime. See Photodigm Applications Note: Contrasting the Photodigm DBR Laser Diode Architecture with Competing Single Frequency Laser Diodes. US Patents 9,660,417 and 10,084,284 issued to Photodigm inventors Preston P. Young and Annie Xiang, and assigned to Photodigm.